A recent discussion with JBL on the pros and cons of different methodologies used to measure dewlap spectral properties has prompted me to write this post. I would like to begin by stating the obvious: you should take my words with a grain of salt. None of my graduate students have followed in my footsteps to work on dewlap color, which might speak volumes about their perception of my expertise on the subject. As a post-doc I had the honor to learn how to collect spectral data from "El Jefesisimo". However, by no means should Leo be blamed for my lack of skill. Over the years we have built a nice number of gadgets with the objective of getting those elusive "perfect" measurements. In the case of dewlaps, I am referring to a nicely extended dewlap, in which the surface is flat (i.e., scales are not irregularly arranged due to way the dewlap is being expanded, thus avoiding the possibility of specular reflection), the dewlap is not pressed against any surface (to avoid the problem of having different distances between the probe and the surfaces of the dewlaps), and the dewlap is not over-extended (which can result in an increase in brightness … and by the way, lack of full extension or compression of the dewlap results in the opposite problem -- you may begin to think that you have a dewlap that is darker than it really is). 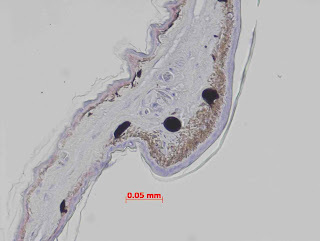 Note, in the case of the anoles dewlap the pigments are not limited to only the areas between scales, as illustrated below by a histology prep of the dewlap of A. cristatellus pigments are also present within the scales. As I learned very early on in my attempts to measure dewlap color, one of the major pitfalls of using a spectroradiometer (yes, the correct term is spectroradiometry, not spectrophotometry) is that those gizmos don't come with a "garbage" detector. Therefore, they suffer from the “garbage in, garbage out syndrome”. In other words, the quality of data is directly correlated with the quality of the surface being measured. You will always get a spectrum by measuring any surface; the question is how good of a representation is that spectrum. I have convinced myself that the best method to hold the dewlap is by having it extended with a gizmo like the one shown in the photo below. It is not perfect, but is as close to a natural extension that I have been able to achieve. Also, I can easily control (and actually see) the location of the probe without any need to guess. I have also tried holding the lizard by hand and expanding his dewlap sideways and take spectrums by using the probe-holder sold by Ocean Optics to hold the probe in place. There are two problems with this. First, it is impossible to accurately know where the probe is located (I don't like that). Second, the holder is so heavy that it tends to change the surface of the dewlap (i.e., scales can change their arrangement and the dewlap gets a funny looking bend on the area on which the holder is located) I am not a big fan of those two possible sources of noise. The other important component needed for measuring dewlaps is the light source. If possible, my preference is to use a Xenon-Arc lamp. Those are great, a nice continuous spectrum similar to sunlight and with sufficient energy across all the relevant regions of the spectrum. 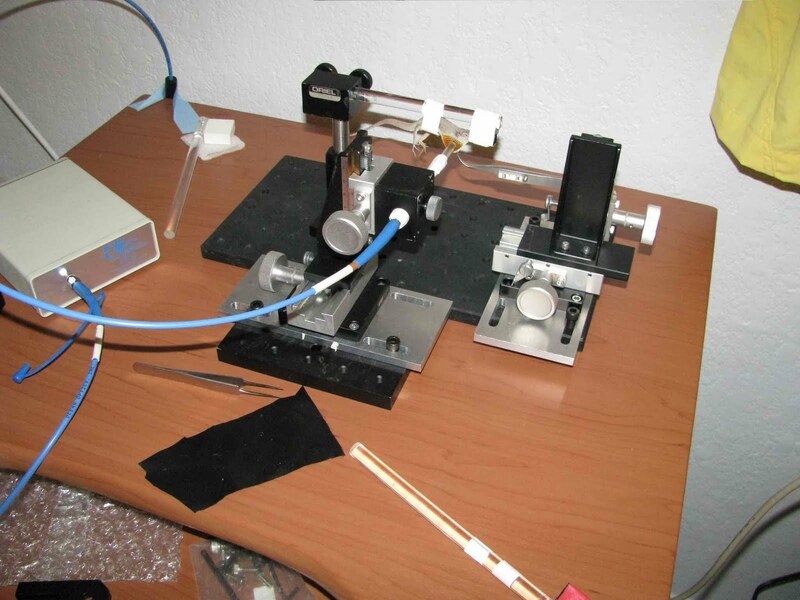 Moreover, in the lab I can use a radiance probe, which is more accurate than a reflection/backscattering probe. However, it is impossible to bring those to the field. Thus, in the field I mostly use a xenon-flash -- not the best -- but it does a relatively decent job. If you are using flash, then you must use a reflection/backscattering probe. 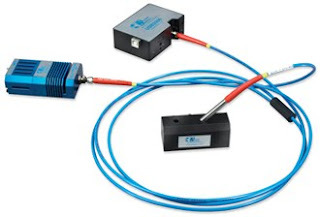 A note about using those probes: they are composed of multiple fibers, and the light source must be connected to the outside ring, while the recording fiber (a single center fiber) is connected to the spectroradiometer … not the other way around! 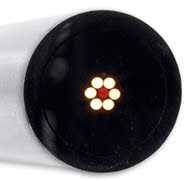 The probe is designed to create a somewhat diffuse light spot and to collect data from the center of the circle. This means that, in reality, you are only sampling the center of the circle. Which should be equally illuminated by the diffuse source. Also, in the case of reflection/backscattering probes, the distance between the probe and the surface must be kept constant because measurements are sensitive to distance. It probably goes without saying that the diameter of the circle will change as a function of distance to the surface being measured and thus the measurements. This may simply be the deranged rambling of a grumpy old man, but I hope it is of some help.